The purpose of this project is to obtain detailed information about factors affecting pavement smoothness during the critical time immediately following construction by conducting a controlled field evaluation of three concrete pavement construction projects. In Phase I, both field and laboratory testing of the materials and construction process were conducted. 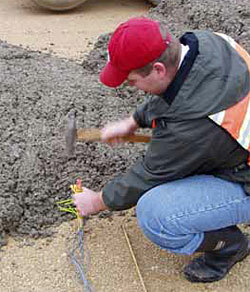 Extensive pavement profiling was also performed during strategic times after placement. As a whole, the data collection effort undertaken by the project team was a success. The result of this project is a large amount of quality data on the early-age effects of curling and warping on pavement smoothness. By using the data from this research and by using the mathematical models being developed as part of current FHWA studies and elsewhere, a better understanding will be gained of the complex relationship between concrete pavement smoothness and concrete pavement curling, warping, and other early-age behavior.